Two late goals from Charlie Evans helped to restore pride and confidence for Rugby Town after last week's disappointing defeat by Cogenhoe. Valley beat sixth-placed Holbeach United 2-0 on Saturday, but left it until the 77th and 88th minutes to make sure of the points. 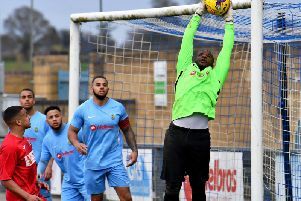 Rugby Town remain third in the UCL Premier Division on 77 points, with Daventry (Rugby's hosts on Easter Monday) top with 90 points now and Deeping Rangers second on 81. Before the Daventry derby, ninth-placed Desborough Town are the visitors to Butlin Road on Saturday.